In the division research is carried out in several fields – Anthropology of religion; Environmental anthropology; Anthropology of Health; Migration and refugees; and Material Culture and Cross-cultural Aesthetics. Many research projects are also carried out in collaboration with Museion; the Dept of Religious Studies, and the Dept for Asian Studies, all at Göteborg university. The department moved location in late August 2005, to Campus Linné, and its three imposing old buildings – Annedalseminariet (Övre Husargatan 34), KK 2 (Konstepedimins väg 2), and Rektorsvillan (Seminariegatan 1). Since 1 October 2006 it is administered as a division within the School of Global Studies at Göteborg University (SGSGU), part of an effort to coordinate global studies across disciplinary and regional limitations. Dr. Kerstin Andersson defended her PhD Thesis in Social Anthropology entitled ”The Kolkata Intellectuals and Bengali Modernity” at the School of Global Studies, University of Gothenburg, on Thursday 2 February 2012. The faculty opponent was Professor Jonathan Friedman, EHESS – École des hautes études en sciences sociales (School for Advanced Studies in the Social Sciences), Paris, France. More information. Even though affiliated to the department of Social Anthropology in Gothenburg, she has since several years lived in Stockholm and attended seminars at the Indology department, Stockholm University, and at the Collegium for Development Studies, Uppsala University. Her PhD project dealt about intellectuals in Kolkata, India, and intellectual movements in Bengal”. In her research she tries to combine the perspectives of Anthropology, Indology and Theroretical Philosophy. Her earlier studies were mainly theoretical studies on the Indian Caste system, and work on Indian non-commercial Cinema. Thesis abstract: The aim with the thesis is to explore and enhance the understanding of methodological questions in anthropological analysis. Kerstin focuses her main argument on topics taken up in antiorientalist and postcolonial approaches. Analysis is closely related to political issues and an analysis include a critical reflection and deconstruction. The discussion is elaborated through the Kolkata intellectuals and Bengali Modernity. The Kolkata intellectuals are vehicles of change, transmitters of ideas and they have had a key function in social, political, cultural and intellectual movements in Bengal during the last centuries. They have played an instrumental role in the construction of discourses and paradigms in Bengal, or Bengali Modernity, a concept introduced by the Subaltern Studies group to denote the new configurations that appeared in the colonial encounter. The Subaltern Studies group claimed that Bengali Modernity was a unique construction, not comparable to western modernity. Hence, the methods of analysis should reflect the Bengali reality and not western conceptions of modernity. The subaltern studies group, influenced by a postcolonial approach, used a post-modern method to analyse Bengali modernity. However, a postmodern approach leads to a series of negative consequences. 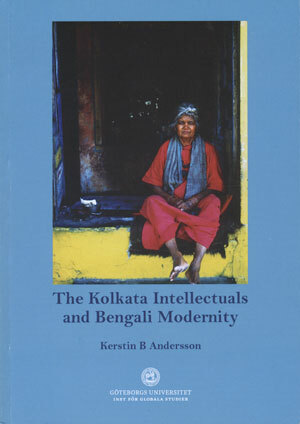 The researcher’s analysis of the Kolkata intellectuals and Bengali modernity extends on this discussion and suggests that a phenomenological method gives the correct device to analyse the Kolkata intellectuals and Bengali modernity, providing a better framework to handle issues such as relativism and the formation of the subject than the postmodern approach. On a theoretical level, an examination of the Kolkata intellectuals and the processes and mechanisms included in the construction of Bengali modernity contributes to a greater understanding and knowledge of the dynamics involved in processes of change and development. On an empirical level, this study, based on extensive fieldwork and comprehensive archival research, gives a wider insight into intellectuals and intellectual groups in Kolkata. Studies of contemporary intellectual groups and contemporary aspects of society and life in Kolkata is a rather neglected area. Kerstin Andersson has frequently visited Indian film festivals, and written articles on Indian film, e g made an extensive interview with the renowned Bengali director Satyajit Ray shortly before he passed away. In NIAS Nytt 1/2000 she published an article named ”Intellectuals, Media and Globalisation”, dealing with West Bengal, India. At the 19th European Conference for Modern South Asian Studies, held in Leiden, the Netherlands, in June 2006, Kerstin Andersson presented a paper titled ”The Kolkata Intellectuals and Social Change” in the panel on Bengal Studies. In July 2010, Kerstin Andersson co-convened the Bengal Studies Panel (Panel No. 23) at the 21st European Conference on Modern South Asian Studies, which was held in Bonn, Germany. The ECMSAS Bengal Studies panel has through the years developed into an important forum for scholars working on Bengal and Bengali studies. As the number of scholars is quite limited and the group is scattered all over the world, the panel provides a meeting point and an opportunity to share research for all with an interest in the culture and society of West Bengal and Bangladesh – and the Bengali Diaspora worldwide. The interdisciplinary approach of the panel welcomed papers on diverse topics such as past and present, literature and media, religion and secularity, women and men, tradition and culture, and on theory and methods in a specifically Bengali context. Dr. Anna Laine defended her doctoral thesis titled ”In Conversation with the Kolam Practice. 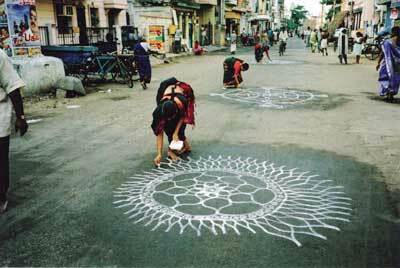 Auspiciousness and Artistic Experiences among Women in Tamilnadu, South India” on Saturday 28 March 2009. It was based on a one year field study from July 2005, with an affiliation to the University of Mysore. The faculty opponent was Dr Amanda Ravetz from the Manchester Institute for Research and Innovation in Art and Design (MIRIAD) at Manchester Metropolitan University, UK. Anna then worked for some years as Assistant Professor at Dalarna University, Campus Falun, and its School of Education and Humanities from the fall 2009, till she joined Konstfack University College of Arts, Crafts and Design in Stockholm where she is now (2016) teaching at the Masters programme in CRAFT! (Ceramics and Glass + Textiles + Ädellab). Read more on Konstfack SASNET page. Thesis abstract: This anthropological study explores the kolam, a South Indian practice where women daily draw geometrical images in front of their homes to invite the deities. Through this practice, women engage in social and religious processes. They generate an auspicious atmosphere and become constructed as feminine beings. Temporal and spatial rhythms are defined and reproduced, and the house is made into a home. At the same time, the practice provides a space for exploration where kolam makers can experiment with changing circumstances and values. The study investigates the kolam both as a performative process, and as a material result, and the ethnographic material is treated from anthropological perspectives on art and gender. To grasp the practice from a wider perspective, multi-sited fieldwork has been employed, among various castes and classes, both in rural and urban areas of Tamilnadu. The aim is to contribute to anthropological understandings of and approaches to images, aesthetics and artistic practice. More information, with a link to the full-text thesis. Besides the anthropological dissertation project, Anna Laine has also been engaged in an artistic project, a form of Visual Anthropology, which also involves the Kolam tradition. Anna, as a photographer and film maker, collaborates with a Kolam maker in Tamil Nadu, S. Malathi, as well as with the Swedish artist Kristina Matousch, based in Malmö but trained at the Royal University College of Fine Arts (KKH) in Stockholm, and Dr Alka Pande, Consultant Arts Advisor and Curator for the Visual Arts Gallery at India Habitat Centre in New Delhi. Dr. Pande has a PhD degree from Punjab University, Chandigarh, and later spent time as a post-doc at the Goldsmith College in London, UK. She has been engaged in the promotion of Indian art, culture and philosophy worldwide for many years, and in December 2006 the French Government awarded her the Chevalier de l’Ordre des Arts et des Lettres, an order formed to pay tribute to the outstanding contributions of artists and personalities in the field of arts, to their nations and to the world. The artists have exchanged knowledge and experiences from a period of working together in India. The aim behind this project was to challenge culturally constructed categories, to investigate particularities and commonalities in our respective backgrounds. The resulting art works were presented as images and performances at the Indian Habitat Centre in October 2008. In a later stage, the works will be presented at an art institution in Sweden. In August 2008, Ms. Laine was awarded a SASNET planning grant to organise a series of interdisciplinary workshops titled ”The Kolam Practice of South India – in Dialogue with Anthropology and Art Practice”. Six workshops were conducted, the first one already begun in 2008, with only four people – Malathi Selvam, Kristina Matousch, Alka Pande, and Laine herself. The following workshops were supposed to be conducted among the informants with whom Ms. Laine worked during her PhD research. Her fieldwork was carried out in both urban and rural areas, working in a couple of villages in Thiruvannamalai district among lower castes and classes, and in both Dalit and wealthy orthodox Brahmin areas in Chennai. Her informants mainly consisted of women, but the work also incorporated the Aravanis, the transsexual gender in this region which also makes daily kolams. The aim of the workshops was to explore a new interdisciplinary approach. Instead of transgressing the border between natural sciences and the humanities/social sciences, this application concerns the border between sciences, in this case anthropology, and art practice. The perspective is to a large extent focused on the investigation of new field methods, but also on new ways of presenting research. More information about the 2008 SASNET planning grants. • Dr. Carolina Holgersson Ivarsson defended her doctoral dissertation entitled ”The Give and Take of Disaster Aid: Social and Moral Transformation in the Wake of the Tsunami” on 11 October 2013. The thesis deals with the reconstruction work in Sri Lanka after the tsunami disaster in 2004, and issues of social fragmentation, human security, place attachment & collective memory. Faculty opponent was Prof. Roderck Stirrat from the University of Sussex, UK. Abstract: The act of giving reflects the most basic principles of morality and has therefore constituted a classical anthropological field of inquiry. The importance of giving, receiving and reciprocating for the shaping and consolidation of social relations has long been recognized. This thesis uses these insights to explore the way in which the gift of disaster aid, which derives from outside the community, impacts upon local social and cosmological relations in a village. The main objective is to investigate how the Boxing Day 2004 tsunami and the immense wave of aid that followed it and subsequently receded, affected the local moral economy in a Sri Lankan village. Read more, including link to full-text thesis. In January 2007, Carolina Ivarsson presented her work at the Nordic workshop on War, Peace and Development in Sri Lanka, held in Göteborg. During the Fall 2007, she was connected to the Foundation for Co-Existence (FCE), Programme Support Unit (PSU), in Colombo, Sri Lanka. Earlier (in 2004) she worked as a volunteer for the Sarvodaya Shramadana Movement, Peace Secretariat, in Moratuwa, and in 2005 she made a Minor Field Study also in Sri Lanka. Professor Marita Eastmond has been involved in research on forced migration, exile and the politics of asylum; social reconstruction and reconciliation in war-torn societies; refugee return and constructions of ‘home’; ethnicity, nationalism and identity politics; violence and trauma, and the anthropology of health. Besides, she is affiliated to the Nordic School of Public Health (NHV). In November 2007, she was given SEK 2.7 million as a three-years grant (2008-10) from Sida’s Developing Country Research Council (U-landsforskningsrådet), for a project titled ”Human Security and Social Recovery in post-tsunami Sri Lanka”. More information about the Sida grants 2007. Associate Professor Ulla-Britt Engelbrektsson has been working on a project dealing with Nepal, titled ”A Social Anthropological study of Gender, Caste and Tuberculosis in a South Asian Context”. The aim behind the project has been to survey and understand the ideological and practical implications of tuberculosis in Nepal. How do affected individuals and families look upon the disease, how are the symptoms interpreted, which are the experienced possibilities for cure and healing, how do people around react, and not the least, what are the economic fallouts? 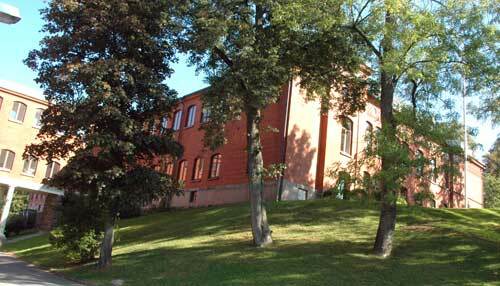 In November 2002, the project was given a three-years grant (2003-05) from the Swedish Research Council. More information about the the project (in Swedish only). Anthropogical field work was carried out in Western Nepal in collaboration with Prof Rishikeshab R Regmi at the Dept. of Sociology and Anthropology at Tribhuvan University in Kathmandu. A number of Tribhuvan University students made their Masters theses within the framework of the project. The project is part of a major research programme about ”Gender and Tuberculosis: An Interdisciplinary research programme for identifying Gender inequalities in India, Pakistan, Bangladesh and Nepal”, headed by Prof. Vinod Diwan at Karolinska institutet Medical University in Stockholm (More information about the programme). Andreas Nordin defended his doctoral dissertation titled ”Pilgrimages in the Himalayas – Interaction with Divine Actors” (Pilgrimsfärder i Himalaya – interaktion med gudomliga aktörer) on Saturday 2 December 2006. Faculty opponent was Prof. Illka Pyysiäinen, Helsinki Collegium for Advanced Studies, University of Helsinki, Finland. He spent a one year fieldwork in Nepal/Tibet, within the Ph D Project funded by the Swedish Research Council in 2003. 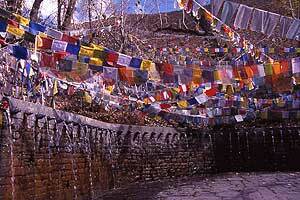 Pilgrimages to Muktinath, Pasupatinath, Mt. Kailash and Manasarovar in the Tibetan and Nepalese Himalayas form part of a broader South Asian pilgrimage tradition. Pilgrimages are usually analyzed as culturally heterogenous and contested events. Through the application of cognitive anthropological analyses it is, however, possible to identify regularities and common practices in pilgrimages. The thesis focuses upon fundamental regularities in pilgrimages, in the form of ritual interaction with culturally postulated divine actors. More information about the thesis (with abstract, only in Swedish). Associate Professor Claes Corlin defended his doctoral dissertation titled ”The Nation in Your Mind: Continuity an Change among Tibetan Refugees in Nepal” at the department in 1975. He is nowadays working on research connected to Vietnam, a project titled ”Ethnic Minorities, Land and State Intervention in Vietnam”. Dr. Alexandra Kent carried out her first fieldwork in Tamil Nadu, South India in 1981 looking at domestic Hindu rituals. This resulted in a Masters dissertation at Edinburgh University, U.K., entitled ”Domestic Ritual in a South Indian Village”. She began her doctoral studies at Goteborg University in 1993. She carried out fieldwork in Kuala Lumpur, Malaysia in 1996-7 studying the Malaysian following of the Indian miracle-working guru, Satya Sai Baba. The PhD thesis that resulted, ”Ambiguity and the Modern Order: the Sathya Sai Baba Movement in Malaysia” was defended in Goteborg in September 2000. Read the abstract. She then continued with post-doctoral research on Chinese participation in the Tamil Hindu festival of Thaipusam in Penang, Malaysia between 2000-2002, and from 2003 she has worked on Buddhist revitalisation in Cambodia and its relevance for the recreation of community. PhD candidate Jan Johansson has worked a research project on ”The Role of Rivers in Bengali Cosmology”, which includes a case study on the significance of the river for farmers in the flood-prone areas of Bangladesh. In Bangladesh the big rivers play a double role as life-giving resources and potential destoyers of life and food supply, and against this background the research project focuses on cultural conceptions about rivers, water and nature. Within the framework of a cosmological perspective, Jan Johansson discusses the great importance that rivers play in the Bengali delta areas not only for the countryside, but also in the landscape that the human body constitutes. Field work was carried out in the Bahmanbaria District in the mid-1990s. The project has been supported by grants from the Swedish Research Council. Jan Johansson is also connected to the Museion department at Göteborg University, where he teaches a course on ”Religion and Politics: Meetings in the Global Space” since 2006. More information. PhD candidate Susanne Åsman worked on a project called ”Gender, Agency and Trafficking among Tamang in Nepal: The narratives, experiences and practices of Bombay returnees.” The project, coordinated by Prof Wil Burghoorn, Centre for Asian Studies, Göteborg University, was given SEK 900 000 as a two-years planning grant (2004-05) from Sida/SAREC in November 2003. See full list of South Asia related research projects that were given Sida/SAREC planning grants in November 2003. In November 2005 the project received SEK 1 100 000 as a continued grant from Sida/SAREC for two years, 2005-06. More information on the South Asia related Sida/SAREC grants 2005. She spent a full year doing field work One year of field work, , 2005-2006, in Nepal and in Mumbai and Kolkata in India within the Ph D project. Susanne Åsman teaches and supervise students at the undergraduate level at the department, and heads a course on Trafficking run by Museion. In 2008 she was guest researcher at Tribhuvan University in Kathmandu. She also planned for an interdisciplinary research project on ”Gender and Transnational Migration”, to be carried out in collaboration with gender and development researchers, political scientists and social anthropologists Tribhuvan University in Kathmandu. In August 2008, SASNET awarded a guest lecture programme grant to Jan Johansson. He was given SEK 20 000 in order to invite Dr. Mahbub Alam, Assistant Professor, School of Liberal Arts and Science, Independent University of Bangladesh(IUB) in Dhaka. He was co-invited by Uppsala Centre for Sustainable Development (CSD) to hold lectures there as well. More information about the SASNET planning grants 2008. The visit of Dr. Alam was carried out successfully between November 19 and December 6, 2008. On December 4 Dr. Alam lectured on “Slaves of Water: Indigenous Knowledge and Experience of Hindu Fishermen on the Floodplain of Bangladesh” at Uppsala Centre for Sustainable Development. The lecture was followed by a more informal discussion about Bengali folk music and a much appreciated performance of different folk songs by Dr. Alam. Two lectures, “Slaves of Water” and “Contested Identities: Folk Music, Religion and Politics in Contemporary Bangladesh”, were also delivered at School of Global Studies, University of Gothenburg, on December 1 and on December 2. The visit by Dr. Mahbub Alam became the starting point for a formal collaboration between the School of Global Studies and the Independent University of Bangladesh. In March 2009 Jan Johansson visited Dhaka and Independent University of Bangladesh. The purpose of the visit was to examine different interests and conditions for a formal agreement on mutual exchange of students, teachers and researchers between IUB and University of Gothenburg. An agreement on exchange activities has been signed, and this also involves the The Department of Journalism and Mass Communication (JMG), University of Gothenburg. Another researcher from IUB, Assistant Professor Manzurul Mannan, came to Sweden in March 2010. On Friday 19 March 2010, he held two lectures at the School of Global Studies, on ”NGOs, Global Development and Local Culture: The Case of Bangladesh” and ”Anthropological Reflections on Neo-Islamist and Western Hegemony: A Sufi Perspective from Bangladesh”. He also participated in the International conference entitled ”Power to the People? (Con-) Tested Civil Society in Search of Democracy” that was held in Uppsala 23–24 March 2010. Dr. Mannan is a Social Anthropologist, who will soon defend his PhD thesis at the Department of Social Anthropology, Durham University, UK. The dissertation project is entitled “Enslaving Development: An Anthropological Enquiry into the True World of NGO”. At IUB, he teaches courses in Ethnographic History, Anthropology and Development of Bangladesh. At the March 2010 Uppsala conference, Dr. Mannan presented a paper on the role of NGOs in Bangladesh. Abstract: Bangladesh is known as Mecca for NGOs. NGOs supported by foreign donors and global policy language are largely seen as an extension of global civil society whereas religious groups are evolved from indigenous civil society. In 1993, NGOs for the first time received religious backlash against their development intervention. This conflict has been seen as a ”defining moment”, or ”turning point” in the evolution of the NGO movement in Bangladesh. The conflict is between two points of view. NGOs believing development agenda and projects to be of benefit to the poor, but the religious leaders see NGOs as a threat to the legitimacy of Islam. The NGO approach to development is interpreted by some Muslims as an effort to ”de-Islamise” poor men and particularly women. It is believed that once women are de-Islamised, it should become easier to convert them to Christianity. The deep reasons of conflict lie elsewhere. NGOs projects are imbued with western ideas of equality, which comes into contact with rural values of Bangladesh society. The process contributes to the development of a hybrid culture. This hybrid culture results from a synthesis between the contradictory, clashing values of Western agency (individualism, equality, market, etc.) on the one hand and Bangladeshi rural cultural life (community, hierarchy, subsistence, etc.) on the other. In this hybrid culture people engaged in development adhere neither to western values nor to local ones. Occasionally, they seek to reproduce rural values in such a way as to fit and define new values associated with development. This paper explains how hybrid culture has created a situation which forces confrontation between the NGO community and Islamic groups/organizations. These clashes in turn, provide religious leaders with the opportunity to emerge as spokesmen for the disgruntled poor and also for the rural elite who oppose NGOs.